One of the thrills travelling by rail is the culinary fare that greets you at every stations and Train is the popular mode of transportation in India. Me, My Sister and Dad took a train from Tirunelveli to Trichy that is 6 hours ride. You have to buy ticket earlier if not they will be sold out even during the normal days. 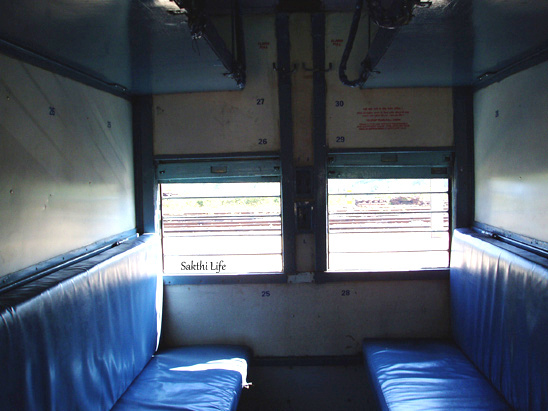 In India, the seats are classified as Lower Berths, Middle Berths and Upper Berths depending on its place. We buy 3 tickets for Second Class Sleeper (Lower Berths) as it will be convenient for sleeping and you won’t have to climb up to sleep. Yeah! If you buy middle berths and upper berths, you have to climb up to sleep and I found it was quite inconvenient. Be early to the train station and wait at the correct platforms. You have to check your name on the chart stuck next to the coach’s door outside to double confirm your place. As our train was at night, people will be start sleeping around 10pm and all the lights will be off. Ticket checker will check the ticket after each stations and the train stop for a couple of minutes in the Small stations. So be quick to get down if your stop is at small stations and make sure to bring original ID proof you used to buy ticket. Buy tickets only from the authorized agents to avoid frauds.Our departure station. Seat Positions: Semi Private Section of 6 seats. 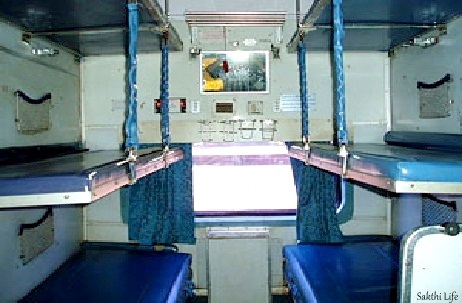 3+ 3 facing each other’s with Upper Berths, Middle Berths and Lower Berths. Foods will be sold throughout your journey. Just it may not be so fresh so buy your foods outside before your travel since we forgot to buy foods, I bought Idly from the train (It was cold and my Chutney was spoiled but my Sambar was okay). Buy near window and lower berths for your own convenient as the views are magnificent. You will pass by villages, garden and can enjoy the beautiful stars at night with cold breeze wind but it might be smelly sometime when the Train passes by dirty area. Carefully listen to the announcement of the location or see the signboard when the Train enters the station to avoid missing your stop. As the announcement will be pretty fast.